Until now, I have not yet reviewed the same pizza twice, but I think that needs to change for a few reasons! 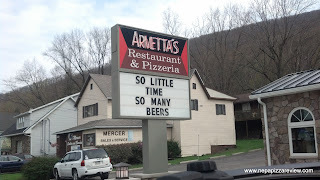 First, I think that winning the 2012 NEPA Pizza Review Best Pizza of 2012 does warrant another visit to Armetta's in Clarks Summit. Next, Armetta's offers both New York Style and Old Forge pizzas, so it was time for me to go back to see how the Old Forge was since I've only reviewed the New York Style so far. In addition, Armetta's was under construction during my last visit, so I needed to go back to see the finished product! Plus there's just so much to say about every pizzeria in NEPA that I could write a totally different article for you all to read! As I pulled up to the new Armetta's, I was impressed with the exterior face lift with a whole new facade, sidewalk, and lighted pillars by the street which set off their trademark sign which always has something clever to say. I walked inside to see that the building had been expanded to make room for a bar in the front area, which was a nice touch to add on to the relatively expansive beer selection. This bar struck me as more of a good place to eat a quick lunch rather than a place that I would want to belly up to for multiple drinks. In any event it was very nice. If you want to read more about the place, check out my previous review here. Let's talk pizza! I ordered a 12 slice Old Forge Red pizza (the menu calls it "square", but rest assured it's Old Forge) for $11.75. I was told 20 minutes to pick it up, and sure enough it was ready right on time. When I picked up the box, I noticed this was a heavy pizza, I’d guess it was north of two pounds so I knew I wasn’t getting skimped on the quantity of ingredients, but the question was – how good are these ingredients?! When I opened the box, the first thing I saw was that the pizza was smothered with a blend of cheeses and it looked melty and delicious. I’m really bad at guessing which cheeses are involved in Old Forge Style pizzas, but I’ll go with American, Brick, and White Cheddar just for fun. One corner of the pizza exposed some of the brightest and most vibrant red sauces I’ve seen, and the raised edge of the crust held it all in. I was glad the crust had the raised edge because there was a lot of sauce and cheese to hold on top of the pizza, and this was achieved here. The first bite netted a lovely range and balance of flavors with the most prevalent flavor being the cheese blend, which gave me a taste sensation of a nice buttery flavor. The cheese was melted perfectly to my tastes (as you may recall, I don’t care for burned American cheese on pizza). Personally I would have liked a little less cheese on the pizza, but I would think I’m in the vast minority here, and most of America would not complain about getting a healthy helping of cheese on their pizza! 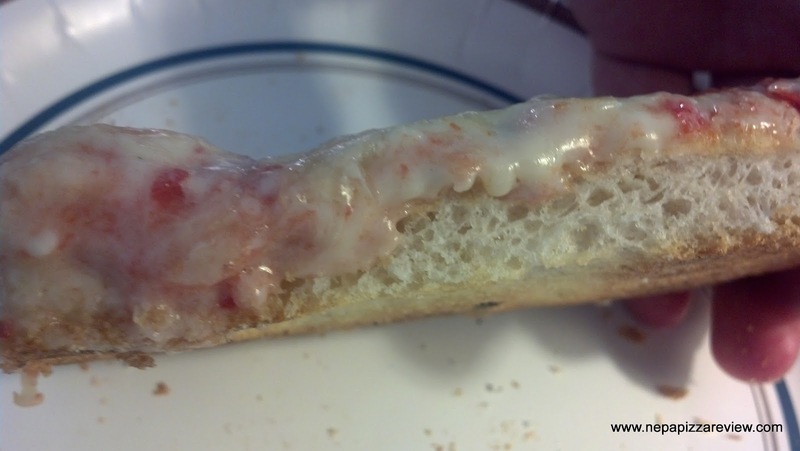 Although the flavors of the cheese do work well, they started to get a little monotonous and dried my mouth out a bit, but this is typical of a pizza with a lot of cheese on it. The sauce was so fresh and delicious, and it was definitely my favorite part of this pizza. It was simple, yet flavorful, and I think its genius is in its simplicity. Although I didn’t find any physical chunks of onions, I did catch a hint of onion flavor in the sauce, so I always have to alert my readers who are onion haters of this. If you just hate having chunks of onions in your sauce and tolerate the flavor, I think you would be okay with this pizza. 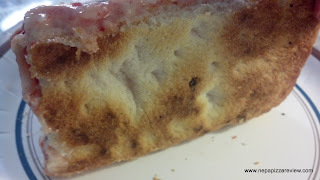 The crust was thick and dense as you can see in the photos. I really enjoyed the flavors which were released from the pizza maker cooking the crust perfectly. The bottom was perfectly browned and crispy, and the raised edge of the crust was definitely the best part. It’s sort of a tender, crumbly type of crust as opposed to the more chewy, bread-like crusts out there. I think the closest crusts I can think of are those from Brutico’s and Salerno’s. Overall, I really enjoyed this pizza although I can't honestly say I enjoyed it as much as the 5 star New York Style pizza that I had there last year. Usually, I benchmark a decent value for an Old Forge pizza at $11.00, and this was a little over that price point, but the sheer volume of ingredients that Armetta's packs into the pie more than justifies the small price premium. I think most people would enjoy this pie as it stays pretty true to the Old Forge formula. Whether you are a New York or Old Forge type of person, I definitely recommend that you make a visit to Armetta's in the near future! Here in Berwick all the locals love Dalo's bakery pizza. Tuzzi (another bakery) pizza is also popular. Dalo's has American cheese and I've tried it a couple times and can't enjoy it for whatever reason. Tuzzi's is more enjoyable with provolone, but it's still not my cup of tea. Is there a great distinction between Old Forge pizza and this 'bakery' style pizza we have here? I'm just curious about whether I might like that style of pizza since unbelievably I've never tried it in the 5 years I've been here. Let me start by saying I just found this blog and I have come no where close to reading even a portion of it. I live out of state now and there is NOTHING like NEPA pizza. 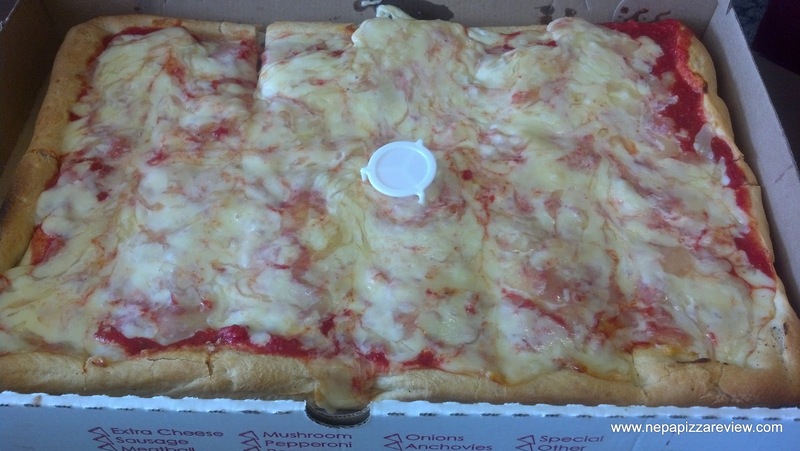 ANd apparently if you aren't from NEPA you're not going to like the gooey cheesed NEPA pizza. That all said, along the way, have you found any recipes to make this style pizza? I can't find anything anywhere and I really miss it! There are so many variations to making Old Forge Pizza, and experimentation is really the key. The dough is a bit tricky at home, but hopefully they sell the premade pizza crusts where you live. I hope to come up with a recipe to post in the future, but if you need a quick fix, old forge sauce is typically crushed whole peeled tomatoes seasoned and simmered on the stovetop, then cooled. The cheese is usually American blended with any variety of cheeses such as white cheddar, brick, cooper, etc.